FME - FOOD MACHINERY EUROPE Sp. z o.o. FME Food Machinery Europe LLC began its activity in 1998. By 2006, the company's profile mainly encompassed the sale the spare parts for machines and rendering of warranty and post-warranty services. The company also offered rendering of marketing services in the scope of customer acquisition. During its initial period of activity, the company's headquarters were located in Warsaw. At the beginning of 2007, the company was moved to Wyżne village located within the territory of the Podkarpackie Voivodeship, where a new production plant was built. The primary goal of the investment was to expand the Company's offer to include the production of machinery and equipment for the food processing industry. 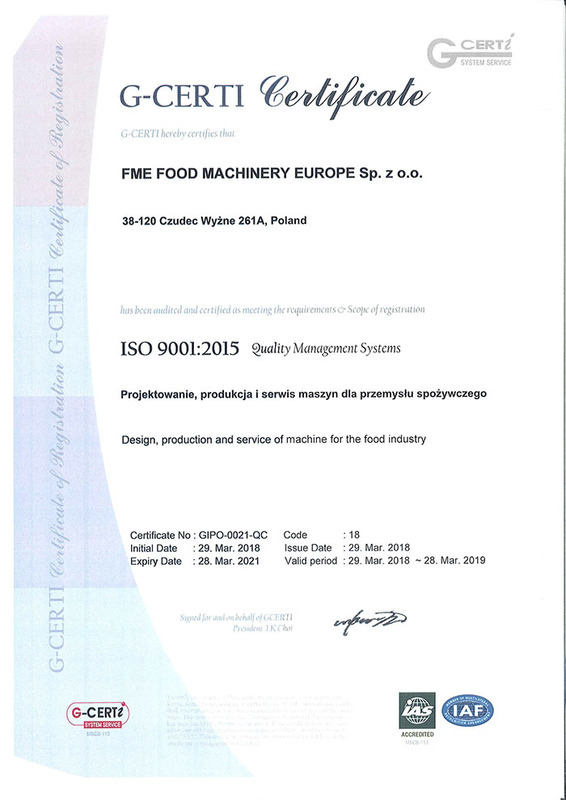 As of now, the company's leading activity according to the Polish Classification of Activity is the production of machinery used in the processing of food, tobacco, and beverage production (PKD 2007 2893Z). Besides this, the company also renders installation services of machinery and equipment as well as repair and overhaul services. The production assortment offered by the company includes lines for standardization, sterilization, and aseptic packing, aseptic fillers, slotted filters, turbo extractors, complete rubbing machine lines, steam pressure vegetable peeling lines, blanchers, lines for production of confitures, jams, marmalades, fruit pastes, as well as fruit candying lines. The Applicant's primary facilities include a production hall with a surface of 1300m2 equipped with an overhead crane with a lifting capacity of 5 tons as well as the TIGER Milling and Drilling Center. Furthermore FME Food Machinery Europe LLC possesses a machine park for production of the process lines it currently offers. All buildings are equipped with electrical, water and sewage, and ventilation installations. FME Food Machinery Europe LLC currently employs 31 persons. The majority of the Company's staff are individuals with higher and technical education that have over a decade of professional experience. For several years, FME Food Machinery Europe LLC has been an active member of the Chamber of Commerce and Industry in Rzeszów. The company also effectively cooperates with academic environments, laboratories (laboratory of destructive and non-destructive tests with headquarters in Rzeszów, acknowledged by the Office of Technical Inspection), and with other companies, which contributes to dissemination of achievements, acquisition of new knowledge, and also makes it possible to monitor and respond to the demands of customers and the changing market in an ongoing fashion. It is worth noting that in 2012, the company obtained a patent for a part/component of the fruit and vegetable rubbing machine and refiner system that it manufactures. 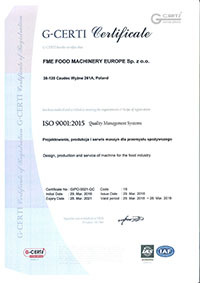 The FME Food Machinery Europe LLC company has implemented the efficient ISO 9001: 2008 quality management system, which will certainly enable effective implementation of the planned project. In addition, FME has purchased the modern GALILEO IT management system in order to optimize the establishment's operation. This system has the purpose of combining the work of individual departments, guarantees fast flow of information, makes it possible to save time, and makes company management more efficient. The products and services offered by the company are in constant demand, and the brand that it has developed over the years enjoys great recognition and trust from customers. The main recipients of products manufactured by FME Food Machinery Europe LLC are companies that are known both in Poland and around the world with many years of experience and which pose high demands concerning quality and the punctuality of deliveries. The company's strong position in the industry is confirmed, on one hand, by references and certificates in the Applicant's possession, and on the other, by sales revenue, which reached a value of 11,958,468.01 PLN at the end of 2011.